The fast , reliable HP 4300N comes standard with 80 MB RAM, an HP JetDirect card for connecting to a network, and one 500-sheet tray. Upgrade options include features like duplexers and extra trays. 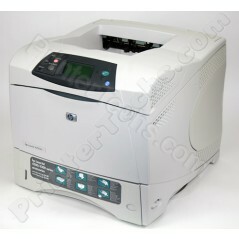 Other models in this series include HP LaserJet 4300 , HP LaserJet 4300TN , HP LaserJet 4300DTN. HP part number Q2432A . This speedy workgroup-ready printer is great for small offices and workgroups alike. It has a high monthly duty cycle and fast output speed. 16.2" x 17.3" x 14.4"